I've been hogging the glider lately. I have two other partners in my glider, and neither of them have been flying it enough. I'm trying not to get too hung up about it, and will continue to fly it as much as I can until they want to start flying it again. To that end, since I've been spending so much time flying the glider lately, I've also been doing work on fixing the little naggy things that have been annoying me lately. While I haven't been doing anything to actually repair the glider, I've been doing other things that makes it easier to enjoy flying the glider. Our road trailer has been in questionably-roadworthy shape for the last five years. The tail lights haven't ever worked correctly, and I've been spending some time trying to get the tail lights to correctly indicate turn signals, brakes, and nighttime tail lights. For something as simple and as straight-forward as tail lights, you could think this would be a simple proposition, but it was not. The original tail lights with the original trailer are about 30 years old, and have the European lighting system. Amber turn signals, white lights for the reverse lights (whoever heard of such a thing on a trailer? ), and bright red brake lights. The wires that connected to the front were connected and jumbled around by the previous owner, connected with some questionable soldering and electrical tape. The jumbled mess had finally fallen apart, and could not be repaired in a fashion safe enough for the road. Even after I managed to get the cables all set up correctly, I realized that I had another, new problem. All of the aging connections were loose enough that any slight bump on the road would cause the tail lights to flicker on and off. I have had enough with this. On a Friday with nice weather, I took off the day from work to get everything working on this trailer once-and-for-all. I went to the Advance Auto Parts and bought a new tail light kit. When I started working on the tail lights for the trailer, my plane was in the trailer and in the way. So I took it out, and assembled it, to get it out of the way. I ripped out the old tail lights, which were attached with rusted-on bolts. There were many swear words shouted out as I tried to disconnect the old tail lights, thanks to these rusted bolts. The old tail lights were destroyed in the process of removing them from the back of the trailer. I ripped out the old cables connecting the tail lights all the way to the front of the trailer. They were filthy, corroded, and the insulation probably was cracked in several places. I threw the whole assembly into the trash. The hardest part, or so I thought, was out of the way. Getting the old hate-inspiring tail lights removed and into the trash. I had no intention of flying on that day, but the weather was looking better; and there my glider sat. Assembled. Looking lonely. Shane, the owner of a shiny and almost-new ASW-27B, came over to me and saw my glider was assembled. "Would you like to come join me on a task? I'm doing a contest next week and want to get in some practice" He described all of the turnpoints on the task, and made it sound like a really good idea. He told me about how good the weather was going to be. I looked to the trailer, in its condition -- with no working tail lights. "I can't really go out on a cross-country flight like this. If I land out, my trailer isn't road worthy. I just ripped off all the tail lights!" Shane is more charismatic than I thought. Somehow he convinced me that this trailer-light-thing was only a minor concern, and we shouldn't worry about it. Soon I find myself programming the task into my flight computer, preparing my pilot-relief kit, water bag, flying hat, and a light snack. It won't be a real contest, since there are only two of us, but there is a task to be flown! Signal Knob, Grant County, Shenandoah, return to Front Royal. Grant County has a 20 mile cylinder, Shenandoah a 30 mile cylinder. Any time spent in those cylinders increases the points cored. Shane heads out first, I follow on the next tow. He's found a nice thermal in the start area, just over Signal Knob at the northern end of the Massanutten mountain range. We do our turns (left turns only), and climb until the start time of 13:10. Shane heads out first. The first turnpoint is Grant County airport, with a 20 mile cylinder around it. All I have to do is fly to an area just west of New Market, and I nick the turn cylinder. The terrain over that area has many mountains and regions without any landable fields. I'm not really that eager to head over that terrain without booming soaring conditions. I head out to the first turnpoint, and find ZERO lift over the valley between the mountains. Not even a whisper of a bump. By the time I get to the Allegheny mountains, I've lost a fair amount of altitude, but the clouds over the mountains indicated that there MUST be something there. Shane is already ahead of me, but I caught up to him, as we shared the same thermal for a few moments. I get in a few turns with a bird, and climb a few hundred feet. Maybe this task will work out, after all. Shane is ahead of me, tops out this thermal, and heads further southwest to find the next thermal. Just as he left, that thermal we were both in disappeared. I don't have a great deal of altitude, and keep searching for more lift further south on the mountain that we were on. There is a light southeasterly breeze, and I found a small ridge that was perpendicular to this wind. I was stuck on that ridge for the next hour. For whatever reason, the thermals just weren't organized well enough, or I wasn't working them, or I was in the wrong place. I spent the next hour going up and down that small 2 mile long ridge waiting for the next-big-thermal to kick off. In the meantime, I had that hour to look at the landing fields to the south. There were plenty. I also had that next hour to think about how I ripped off and destroyed those tail lights on my trailer, and how I really shouldn't have gotten this far from the airport without a working glider trailer. Here's a Google Earth image of me spending an hour stuck on a ridge, looking for an escape route. I entered the scene from the bottom of the picture, and exited the scene with the line moving to the left of the picture. Blue lines indicate a rate of descent. White lines are neutral -- neither sinking nor climbing. 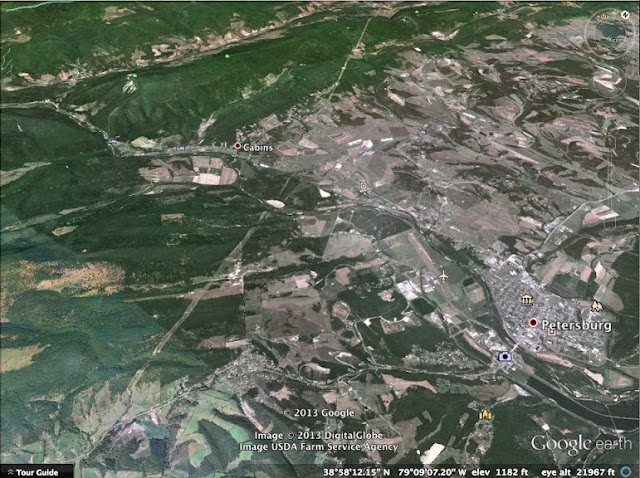 Green lines indicate places where I was climbing. The darker the color, the stronger the climb or sink. I circled over somebody's house on the top of that mountain. I wonder if they noticed. I wonder if they thought my plane was a government drone performing silent surveillance of their nefarious activities. Eventually, I connected with a strong enough thermal to escape from the mountain. I headed directly for Burner Field, just west of Woodstock, VA. If I landed out there, at least the towplane could come get me, and tow me back to Front Royal. That way I wouldn't have to worry about driving the illegal trailer without tail lights. I managed to scrape up enough lift to comfortably return to the airport without any further close-calls for landing in a field. I was really thankful that I didn't have to land out on that Friday. As I was circling over the airport, Shane called in over the radio. He had landed out in a field 10 miles south of Burner Field. I'm so glad I made it back! Here's the record of my flight on OLC. I took off a week from work to experience the thrills of flying over West Virginia. 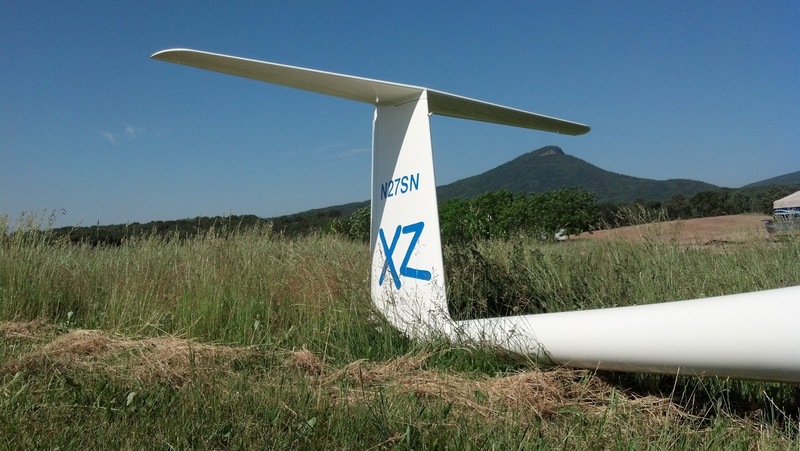 The fixed base operator at Grant County airport in Petersburg, West Virginia hosts an annual event, inviting glider pilots to bring their gliders out and experience the excellent soaring conditions. The Grant County airport is located in the perfect place for setting up wave lift. Situated just south and west of the town of Petersburg, West Virginia, the airport is also downwind of the Hopewell gap. Through the Hopewell gap flows the southern fork of the Potomac river. What makes this geographic region of interest to soaring pilots is the meteorological phenomenon of 'wave lift.' This type of soaring condition allows gliders to climb -- without the aid of an engine -- to spectacular heights. These altitudes generally get into the 30,000 feet range in Nevada. The lift is also strong in the eastern states, allowing gliders to climb to altitude in the 24,000 feet range. These altitudes are generally unheard of in the rest of general aviation. Normal pilots who don't fly jets don't ever get anywhere near these kinds of altitudes. The week started off with a sinus infection that grounded me for the first few days. It is not only no-fun to go flying with a head cold, but there is a significant risk of debilitating pain associated with 'sinus block'. The air pockets trapped in the maxillary sinuses become enlarged as the altitude increases, causing crushing pain and swelling. This made me stay on the ground for the first four days of the wave camp week. It's not that terribly large of a loss, because the weather wasn't that great during this part of the week. While the winds tended to be favorable for this type of wave flying, the clouds and precipitation were not favorable to flying. Those brave souls who were a part of the wave camp during the week stayed on the ground for the most part. I got the opportunity to stay at home and treat my cold with OTC remedies. By the time the weekend rolled around, I was feeling better, and trailered my glider from its normal hangar slot in Front Royal to Petersburg. We had recently installed brand new tires on the trailer, along with some long-needed replacement parts for the trailer, so I was much happier about how the trailer was rolling on the highway, than in previous years. When I showed up on Thursday, nobody was flying. The weather conditions did not favor flying. The clouds were overcast, there were snow flurries, and the winds were not from the correct direction. Instead, Brian Collins was studying the maps, and plotting courses for his new long-distance flying adventure. 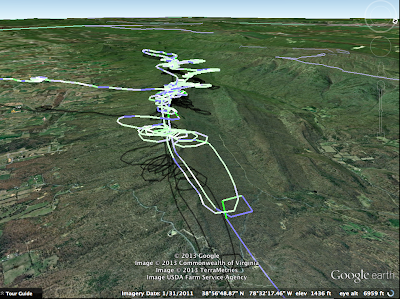 He is currently trying to fly the new 1250 kilometer course that is counted by the FAI. He has done 1000 kilometer flights in his PIK-20 in previous years, and is always looking for a better flight. Also at the field was Ward, a meteorologist who normally flies out of Wurtsboro in New York. He has been chasing the diamond altitude climb for a long time, and was hoping that this trip to Petersburg was going to be his magical trip. On Saturday, I assembled my glider for a nice round-the-patch flight. Two gliders had launched, and were staying aloft. The third launch was staged by a glider pilot named Greg. He was flying a HP-304CZ, and looking forward to flying for the first time in several days. As the tow plane descended from the second launch, the tow pilot remarked that he was getting asymmetric flap deployment on the tow plane. The right one was descending, but the left one was not dropping. He made an uneventful no-flaps landing, and the mechanical problem was surveyed by several people. Unfortunately, the towplane had a broken flap that grounded it. No more tows from this tow plane for the foreseeable future -- parts had been ordered, but wouldn't show up for at least a week. Thankfully, there was another tow plane -- from Shenandoah Valley Soaring. Unfortunately, that tow pilot wasn't at the field on Saturday, and the remaining operations for the day were scrubbed. "Disappointment is a part of aviation" I quipped. If you can't put up with disappointment, then aviation isn't a sport for you. I disassembled my glider, and put it back into the trailer. I helped Greg push his glider to a tie-down spot, and he kept his glider out in the open overnight. The two pilots who launched before the towplane mechanical failure had cold flights, but each managed to stay up for a few hours. The weather report for Sunday promised to be more favorable. The temperature dew-point spread was supposed to widen as the moist air moved east, giving us increasingly drier air. Monday was supposed to be even better, with very dry air, a more favorable amount of wind at higher altitudes, along with a more favorable wind direction. Greg and I asked Brian if he knew of any easy ridge-flying tasks that would get us 500 kilometers. With the winds for Sunday forecast to be excellent ridge soaring, and OK wave soaring, we opted to see what we could do on the ridge. I have done a lot of ridge flying next to the Massanutten mountain chain in proximity to Front Royal, but haven't done any ridge soaring on these mountains. I wasn't that familiar with the turn points and what it would take for a 500k diamond goal flight. Brian came up with a task that would have been 'easy' given the projected Saturday conditions. Hopewell Gap -> Mountain Grove -> Keyser South -> Sunrise Dam -> Hopewell Gap. That means a trip along the ridge southwest, where the ridge is perfectly shaped, back north to a town just south of Cumberland Maryland, back down to a man-made lake dammed by Sunrise Dam, and back to the notch in the ridge near Petersburg. Greg and I might even be able to see each other while we were doing the same task. On Sunday, I programmed the task into my LX-Nano, as well as the SN-10 flight computer, and headed out behind Greg. Greg reported over the radio before I took off, "It looks like there are snow showers to the south blocking our task"
Instead, I opted to do a flight making use of the wave lift that was happening on that day. The wave lift was moderately strong lift, about 700 feet per minute, and I quickly climbed above the clouds, squeaking through a narrow hole in the clouds. As I climbed through 10,000 feet, I took this nice picture, showing my position above the broken clouds. I watched the clouds closely, and made sure that if at any point, the clouds looked like they were going to go from broken to overcast, that I would make a rapid descent through the closing holes. As the NOAA weather forecasters predicted, the wind strength at altitude got weaker to the point of no longer sustaining strong wave lift. By the time I got to 12,800' MSL, there wasn't much more oomph to the lift, and I was finding 50-100 feet per minute climb instead of the much more favorable 7 knots lift that I was experiencing at 10,000 feet. I looked down and saw the clouds getting bigger, and the holes getting smaller. I found the largest hole between the clouds that I could see, set my speed to 80 knots, opened the spoilers, and aimed my descent through the hole. It was a good thing I made this decision, too; the holes got more closed up a few moments after I descended. After I landed, we were faced with the problem that Monday looked REALLY good for wave lift. We would have easily been able to extend the wave camp for another day, if we hadn't had a towplane mechanical failure on Saturday. We spent the remainder of Sunday trying to score a tow plane and pilot for Monday morning. We finally managed to sweet-talk the SVS guys to come out on Monday and give us some tows for the excellent forecasted conditions. The tow pilot for SVS was also a commercial pilot and had a possibility of getting a flying gig for money, flying much larger aircraft. By Sunday evening it was clear that the tow pilot would not have that other gig, and would be available for us. The SVS club had aerotowed their glider from Waynesboro, VA to Petersburg, and since the wave camp was done, they were returning their tow plane and glider by means of a cross country aerotow. Fortunately for the remaining stalwarts, Brian, Ward and I, the SVS guys were willing to give us tows to make sue of the excellent Monday soaring opportunity. I woke up early, and put on all of the warm clothes that I had packed. I realized at this point that I had not packed enough warm clothes for my feet. I was wearing thermal underwear (that I usually use for running in the cold weather), sweat pants, and a big orange insulated jump suit. On the top, I was wearing 3 or 4 layers. I am the sort of person who can sit around at 15C quite comfortably in a tee-shirt, so wearing all of these layers was quite out of the normal routine for me. In a glider at those altitudes, with those predicted temperatures, every layer I could stuff onto my body would make a difference at altitude. The chemically treated toe warmers don't do much good at altitude -- they don't have enough oxygen to make the chemical reaction work. Electric toe warmers are about the only tried and true technology. I just don't have any. In fact, as a person who hates boots, and also pretty much hates all kinds of shoes, I have very few shoes to choose from. The only pair of shoes that I had was a pair of sneakers that are not air-tight. They were originally running shoes, with breathable fabric. This is not going to end well. The good news is that my feet stay warm into much colder temperatures than your average American experiences. I can walk barefoot on snow for a significant amount of time, and can run outside barefoot in temperatures down to 30F without any serious discomfort. Brian was first to launch, with a 1250 km task in hand. I launched second. Ward decided to launch later in the day, because the weather was predicted to have strong enough winds for the really high altitude climb only after noon. I took off at 15:23A, and after a very short aerotow (3 minutes! ), released at 4300' MSL in strong lift. I managed to release from the tow plane in an area where there was significant lift. I climbed without losing any altitude and quickly established the wave lift as I turned upwind at 15:32Z (10:32 local). As I traveled upwind, the wave was lifting me at around 500 feet per minute. There were a few wispy clouds around, and I flew to the upwind side of these, hoping for stronger lift. At 5300 feet, I connected with 15 knots of lift for a brief period, and started the climb about the same altitude as the low flying clouds. I called in over the radio to the folks on the ground, "I'm in wave lift" I continued climbing until about 7100 feet, when I decided that the lift would be stronger upwind. I headed upwind to the mountain just south of the Hopewell gap. (seen in the Google Earth image below). The wave lift wasn't nearly as good as I had hoped. I stayed in front of the clouds, even though I was above them at this point, but I had not found the wave nearly as strong over this area as I was hoping. After a brief northern loop in weak wave, I made one more hop upwind (also seen on the picture above). The blue path just above and to the left of the cartoon bubble in the picture above shows the area where there was only a downdraft of air -- but not terribly powerful. I had finally moved forward into air that was consistently lifting, even though I was well upwind of the main ridge line, and upwind of the Hopewell gap. I wouldn't have to go downwind of this point from then on. Above 9000 feet, the lift was never that strong, and I just sat back and enjoyed the view as I climbed at modest rates. I called down to Petersburg to report my progress. Ward had not launched yet. I tried to get my point across that the wave was working, and sitting on the ground waiting for it to get better was not the best of strategies. Ward launched a short while later. Above 18,000 feet is a magical airspace called "Class A airspace". Only aircraft in control from air traffic control, flying under instrument flight rules are allowed to fly above 18,000 feet in the US. 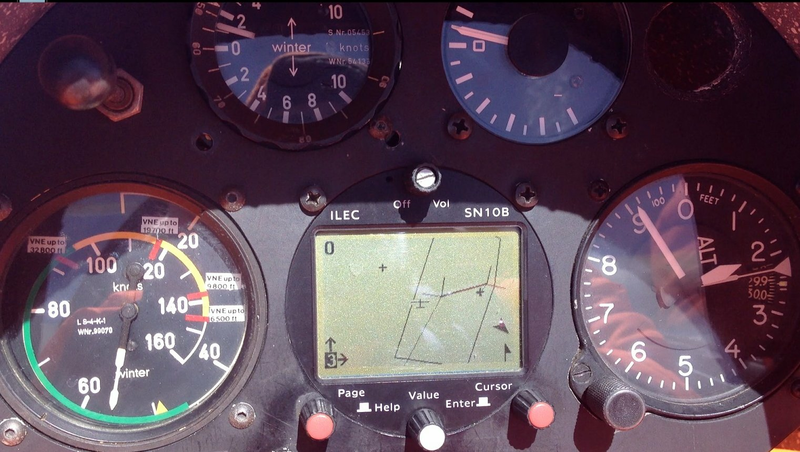 In order for a glider to fly above 18,000 feet, he either has to be flying under an IFR flight plan, or must be flying under a waiver. The Appalachian Soaring Association has applied for, and been granted such a waiver from the airspace rules. They have to activate the wave window a few hours prior, and air traffic control will route all jet liners and other IFR aircraft around this block of airspace. By 16:28Z, I was climbing through 14,000 feet. The rate of climb wasn't the best that I had seen, but it was consistent. I had my oxygen mask on for a while, and everything was shaping up to be a great high-altitude flight. As I climbed higher and higher, the radio chatter on the Common Traffic Advisory Frequency (CTAF) got more chatty. As I climbed, more airports using the same frequency as Grant County started becoming reachable. And the radio started squealing more often as some Cessna pilot in Pennsylvania would announce his landing pattern as another Bonanza announcing 5 miles out from an airport in Virginia. I called down to Grant County and confirmed that the "wave window" was open. Larry told me that it had been open since 0900 this morning. Everything is shaping up to be a great flight! Weeks earlier, I went through the process of getting the details for the Petersburg and Skyline Wave windows, and putting them into a format that my flight computer can use to display airspaces in-flight. This work had paid off very well. I tuned my SN-10B into map mode, and got a representation of my position relative to the wave window. Even though I was on the eastern edge of the airspace window. Before I climbed above 18,000 feet, I ventured even further east of the wave window. I found excellent lift far upwind of where the wave should have been. 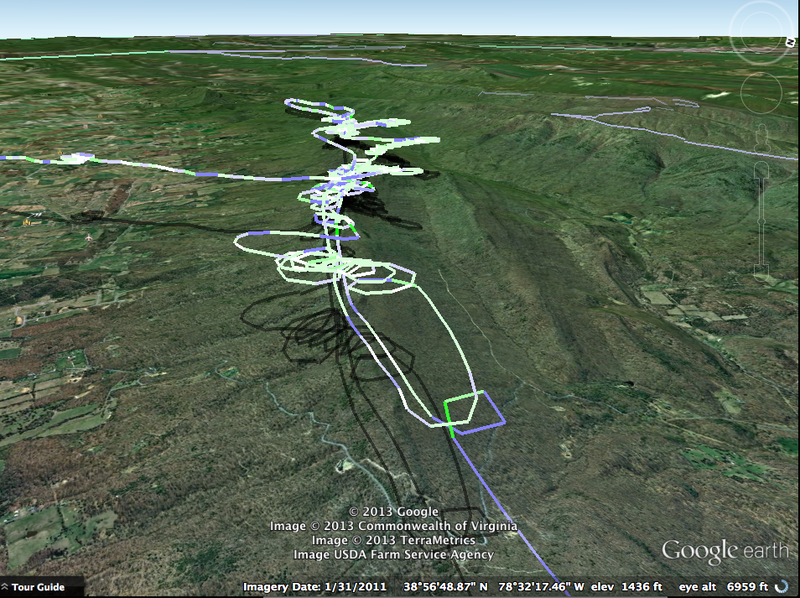 As I climbed closer to 17,000 feet, I made sure that I was well within the airspace boundaries. The highest I have ever been in a glider was on 4 September 2011, a nice summer-like day, when I launched with sandals and shorts, and promptly climbed to as high as I could stand. On that day, we didn't have an activated wave window near Front Royal, and I didn't shave the night before. My cannula was only good up to 18,000 feet, so I aborted a steady climb at 17,600 feet. On this March day near Petersburg, I was clean-shaven, wearing my full oxygen mask (instead of the cannula), and ascending into the wave window. 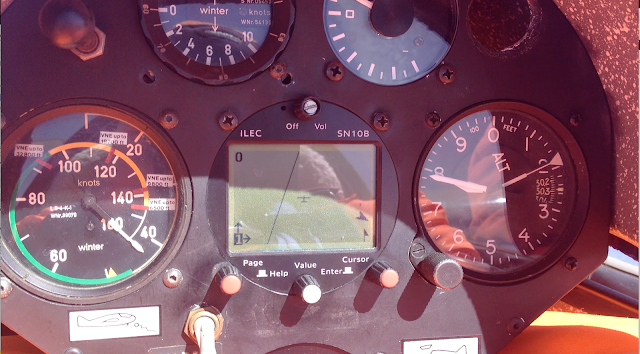 As I approached 18,000 feet, I dialed my altimeter from 30.13 In Hg to 29.92 In Hg. Once I made this change on the altimeter, the altitude is no longer referred to as 18,000 feet, but now Flight level 180 (FL180). This distinction is important as my climb approaches the top of the wave window, FL230. As the air pressure might be different than the standard 29.92, I could be at 23,000 feet, but be several hundred feet above FL230. The FAA would not appreciate me flying into class A airspace, so I made no plans to get any higher than FL220. Right before I changed my altimeter, I made a short video, and got this picture of my instrument panel. 17,800 feet, and well within the wave window. I kept checking my oxygen system. It's still flowing. I'm still hearing puffs of air fill my oxygen mask. I am still thinking clearly. (I think). I checked the picture of my aircraft relative to the wave window. I checked the altimeter. I checked the rate of climb. I switched pages on the flight computer to see which way the wind was coming from, and how fast the computer said the wind was trying to blow me SouthEast. These tasks kept my pretty well occupied until I approached 22,000 feet. I mean FL 220. By this time, my feet were quite cold. Those two layers of socks and sneakers with mesh breathable top weren't the best choice; but I managed to survive. I kept flexing my feet whenever they got painfully cold, crunching the toes together, letting them relax. Doing this every 3 seconds until my feet got tired. I checked the flight computer for the outside air temperature at 16,000 feet, but never remembered to check again as I got to my maximum altitude. The NOAA predicted -20C at that altitude. I think that's close enough. The sunshine was keeping my torso and face warm. The full face mask of the oxygen system served to keep my face from feeling cold. I never put on my gloves. It was not completely inhospitable. At 200 feet before FL 220, I made a quick video, got a picture of my instrument panel, and no longer actively sought the lift. I didn't open my spoilers, but did increase my airspeed, flying north toward the power plant and windmills at the Mount Storm substation. I flew to the northern corner of the wave window, and circled south again until I was below 18000 feet again. I turned off my radio because the squealing from CTAF pattern shooting traffic was annoying me, and I wasn't confident that the plane's battery was going to hold up in the cold temperatures and long flight. I flew south, descending to around 16,000 feet, and re-connected with the wave lift. 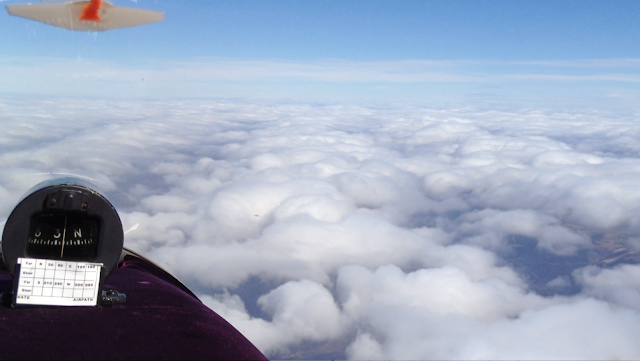 Instead of climbing, I used the wave lift to make a flight south for several miles without any loss of altitude. I flew 30 statue miles south of the Hopewell gap, getting close to a mountain named "Snow Mountain"
Snow mountain is where Brian flew on Sunday, trying to figure how to get around some snow showers that stuck around that point. On that day, it was called Snow Mountain for a reason. It was also that snow storm that kept me from even starting the 500km task on Sunday. Travelling those 30 miles south was easy. Maybe it was a little too easy! I had lost only 100 feet for 20 of those 30 miles while travelling along the wave. I turned around and realized that the ease of my southern trip was from a slight tailwind along the route. I turned around at my most southern point at 18:27Z. 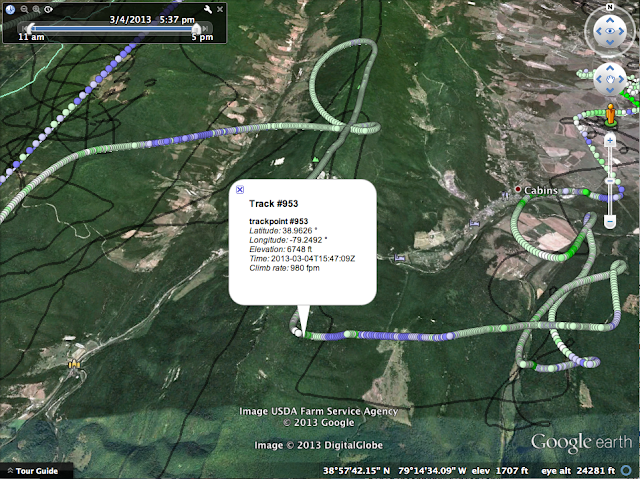 On my northern track, I had the same airspeed, but a much lower ground speed. In addition to the slower ground speed, the sun was now at my back, and things got a bit colder, the longer I headed north. I flew north of the Hopewell gap, and continued north, sight-seeing along the way. I flew to the town of Keyser, and had a good look at Cumberland from this altitude. By my most northern point, I had descended to 12,400 feet MSL, and made my most northern point by 19:50Z. The cold had started to soak into every part of my body, and I was starting to have enough of this flight for the day. I turned south, without any regard for staying in the lift, and removed the oxygen mask at around 11,000 feet. I quickly realized that all of my exhaled breath had condensed on the oxygen mask, leaving my face wet, and now exposed to the oncoming air from my air vent. I put the oxygen mask back on. By the time I got to Petersburg, I still had loads of altitude to spare. Ward had taken off, gotten into the wave, but was never able to connect with the high altitude wave, and had already landed. I made several turns, and eventually opened the spoilers to increase my descent rate. It got remarkably warmer as I descended. Larry told me that Brian had landed out somewhere very far to the southwest. Ward came over the radio to congratulate me on my diamond altitude climb. I made a beautiful landing, and stopped precisely at the taxiway, where Larry came to greet me in his golf cart. I got out of the plane and jumped up and down to get the feeling back in my feet. At that moment, my iPhone fell out of my pocket and landed face down, shattering the glass... The $200 to replace glass on the iPhone. I flipped off the master switch, shut the canopy, hooked up the glider to the tow rope, as Larry towed me with the golf cart. I recalled all of my flying adventures to Larry, who was happy that somebody had finally made use of the wave window this year. "We've had somebody get their diamond altitude for the last three years now!" This is great. I got the glider back to the trailer, disassembled and put everything back into the trailer in the windy conditions, with Larry helping. I pulled out the two water bottles that I had packed in-flight, and they were frozen solid. It's a good thing that I was never thirsty through my flight! (It's also a good thing that I managed to have a five hour flight without needing to pee). I called Brian to make sure that he didn't need anything from me. I was willing to drive down his car to where-ever he was, pick him up and come back to Petersburg. By the time I called him, he had already gotten his wife to agree to come out to Petersburg (from Northern Virginia), drive down south to pick him up, and then come back to Petersburg to pick up her car, then drive home. Man, I would never want to make that phone call to my wife. Even if Brian can afford the next year's worth of kitchen points, she's still a keeper. I drove back to Front Royal with the glider in tow. After I put the trailer back into the hangar, I pulled the Nano out and uploaded my flight to OLC. Why is that validate icon red? The IGC file got corrupted. This time, in a manner that I had never seen before. The IGC file never recorded a valid signature. I probably won't be able to submit this flight to the SSA for use as a diamond altitude flight. After researching what happened, the engineers at LX-Nav told me that I should make some changes in my procedures. The top of my IGC file shows the features that are turned on and off for the LX-Nano. The engineer noted that 'LLXVALALWAYSRUN' should never be set to 'TRUE' in my set up. Since I have my SN-10 hooked up to the Nano, I also had to hook up the electric supply for the aircraft to the nano as well. Once, my flying partner flew the glider for a nice flight, then never turned off the Nano by the power switch after the flight. The Nano recorded 3 days worth of GPS coordinates from inside the hangar, until the battery drained. After that event, I changed the setting on the Nano to shut off when the external power is shut off from the Nano. It turns out, this was a terrible mistake. Consider this scenario: You're sitting at home. You're typing a nice letter in your favorite word processor. All the sudden, somebody trips on the power cord, and the computer becomes unplugged from the wall. All of your work is lost, right? Well, maybe the word processor program wrote some part of your draft to disk somewhere along the way, but it certainly didn't shut down properly. This is essentially what happened for my flight recorder. It got a brutal power interruption, and never wrote the IGC signature at the end of the file. The IGC signature is how the SSA and FAI know that I wasn't cheating about the flight's specifics. Without this signature, I'll never be able to submit it as a badge flight. "Disappointment is a part of aviation", right?